a) A graph showing the area of observed sunspots dating back to 1880. b) Simulated magnetic flux using the new computer model. A newcomputer model which accurately simulates the Sun's past few solar cyclespredicts that the next cycle will be up to 50 percent stronger than itspredecessor and begin a year later than expected, scientists announced Monday. The National Center for Atmospheric Research's (NCAR)Mausumi Dikpati and colleagues developed the model, which is detailed in theMarch 3 issue of Geophysical Research Letters, and announced theirfindings in a press conference today. The model offersa possible solution to the 150-year-old mystery of what's behind the Sun'sapproximately 11-year cycle of activity. It could also lead to better planningfor space weather, such as solar flares and coronal mass ejections, which candisrupt navigation and power systems and threatenastronauts in space. The Sungoes through approximately 11-year cycles that range from peak activity toquiet and back again. We are near the low point of the current cycle. Scientistshave tracked the cycles for decades but have been unable to predict when theirdurations and intensity. 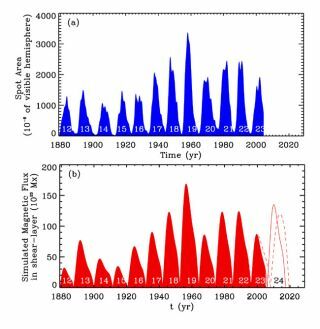 The newmodel, known as the Predictive Flux-transport Dynamo Model, has simulated thestrength of the past eight solar cycles extending back to the early 1900s with98 percent accuracy. Using themodel, researchers predict that the next solar cycle, known as Cycle 24, willproduce sunspots across an area slightly larger than 2.5 percent of the visiblesurface of the Sun. They also expect that the cycle will begin in late 2007 orearly 2008--about six to 12 months later than earlier predictions--and reach itspeak in 2012. Theresearchers attribute the accuracy of the new model to recent observations ofhow currents of electrical gas called plasma circulate between the Sun'sequator and its pole, and how these currents are affected by the Sun'srotation. The birthof a new sunspot begins with the death of an old one from a previous cycle. Asan old sunspot decays, it leaves a magnetic "imprint" or signature on the flowof plasma moving between the Sun's equator and its poles. As theplasma current approaches the poles, it sinks about 124,000 miles (200,000kilometers) down into the Sun's interior and starts its return journey back tothe equator. Thesesubsurface plasma flows have been verified with observations from NASA's Solarand Heliospheric Observatory (SOHO),which uses sound waves inside the Sun to reveal details about its interior. Observationsshow that as the plasma currents move, they are affected by the Sun's rotation.Unlike the Earth, the Sun's equator moves more rapidly than its poles. Thisdifferential rotation stretches and twists the moving plasma current, making itmore unstable than surrounding plasma. Eventually, the warped plasma currentsrise up and tear through the Sun's surface, creating a new sunspot. When the newsunspots begin to decay, the cycle begins anew. DavidHathaway, a NASA solar astronomer who was not involved in the study, said he isexcited about the new model. "It's basedon sound physical principals and it finally answers the 150-year-old questionof what causes the 11-year sun spot cycle," Hathaway said. Hathaway'steam agrees with Dikpati that Cycle 24 will be stronger than the last one, butdisputes the claim that it will occur later than expected. Afterreviewing the previous 12 solar cycles, Hathaway's team believes large cyclesusually start early and that Cycle 24 will start sometime later this year orearly next year. The newpredictions could mean that Earth could experience more intense solar flaresand related spaceweather in upcoming years. "Thisprediction suggests we're potentially looking at more communications andnavigation disruptions, more satellite failures, possible disruptions ofelectrical grids and blackouts and more dangerous conditions for astronauts,"said Richard Behnke, program director of the National Science Foundation'sdivision of atmospheric sciences, which funded the research.